This week we sat down to talk to longtime friend of Paul Longmore, Anthony Tusler, at his house in Penngrove, CA. Disabled since the age of five, Tusler is a motorized wheelchair user. Describing Anthony’s contributions to disability rights and advocacy takes some time. In addition to over 20 years as director of disability services at Sonoma State University, he has led important work to draw attention to the higher rates of alcoholism and drug use in the disability community, he has researched and published about technology and access, and he also promotes disability in the arts, through his own photography and studying disability in music. He first met Paul Longmore back when Paul was a graduate student writing about George Washington. A shared colleague recommended they meet, and Anthony remembers thinking then that Paul would some day be a leader in the disability movement. Shortly after, Anthony arranged to have Paul give a lecture on euthanasia for The California Association for Post-Secondary Education and Disability (CAPED) because he knew Paul had a voice and perspective that needed to get out there. While many of Paul’s friendships were more academic and bonded in disability theory, Anthony recalls that their connection was rooted in a shared love for disability culture. When Paul Longmore almost poisoned himself by taking too much Zinc to fight off a cold, Anthony just laughed to Paul’s relief, both agreeing that such a mistake was standard “crip stuff." Since Paul passed away and the Longmore Institute reemerged in 2012, Anthony has been a vital supporter, both with his time and as a donor. In 2013, he hosted a concert at his home to benefit the Longmore Institute. 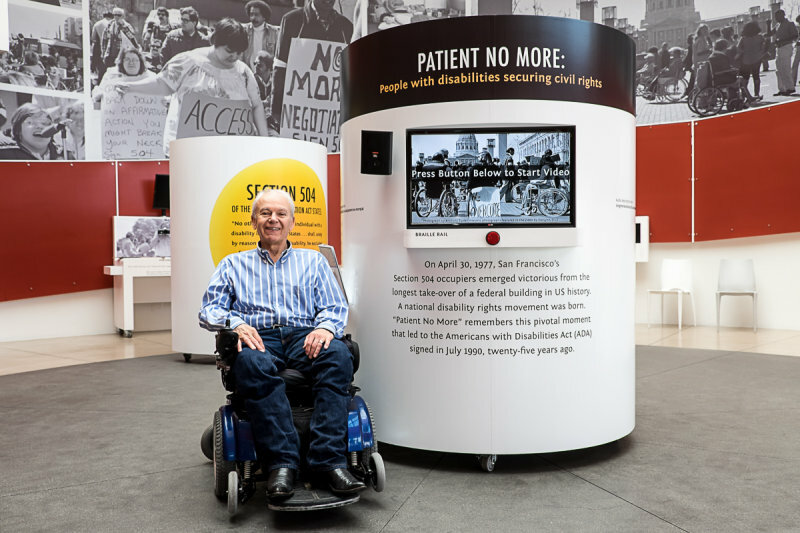 He played a number of roles to support the Patient No More exhibit, which featured his photography from outside the building on the first day of the 1977 504 occupation. It’s not an exaggeration to say that the exhibit could not have happened without him. In particular, he convinced photographer and 504 protester HolLynn D’Lil to share her historic collection of photographs, primary sources, and notebooks, previously kept private. If Anthony had not vouched for the Longmore Institute’s integrity and recognized the importance of making this collection public, “Patient No More” might not have had enough materials. Anthony poses before giving a photography lecture at the Patient No More exhibit. Photo courtesy of Anthony's Facebook page. 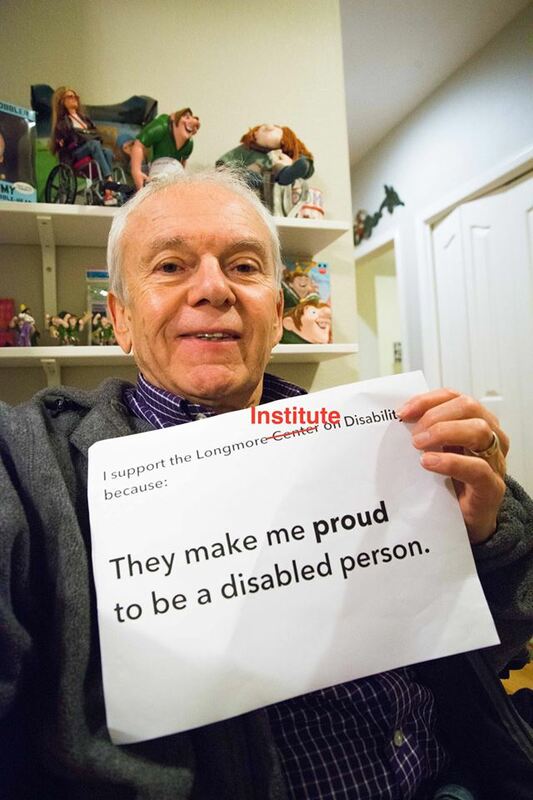 He urges other people to start volunteering with or donate to the Longmore Institute because “Disability culture is essential to our efforts to improve the lives of people with disabilities. It can’t just be about services.” Anthony’s friendship with Paul Longmore was based on this belief, and he is grateful to see that the Institute’s recent work supports it as well. Anthony has supported our annual Giving Tuesday efforts for the past two years. Photo courtesy of Mr. Tusler's Facebook page.